Content: This is the next 12” of AnD, which is taken from the “Cosmic Microwave Background” full length album. 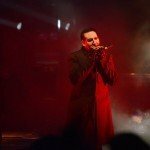 We get 3 more remixes, but this time from 3 songs. “Rmx 01” appeared to be an offspring between techno and darker electronic styles like industrial while this vinyl is not as dark and more into sophisticated treatments. 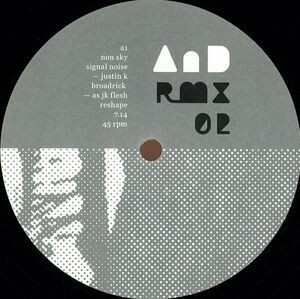 The so-called “Justin K Broadrick As JK Flesh Reshape“-remix of “Non Sky Signal Noise” probably is the darkest piece of the vinyl, but the acid bleeping treatment of this remix is the main characteristic. The B-side features 2 remixes by Black Rain opening by a remix of “The Surface Of Last Scattering”. This is a fascinating sonic experience revealing an experimental approach made by different noises carried by a slow cadence and with some comparative IDM inspiration. The last remix is one of “Galactic Motion”, which reveals deep, vibrating sound blasts and a terrific loop of manipulated sounds. Conclusion: “Rmx 01” and “Rmx 02” both are complementary releases, which you better not separate from each other, but this one will mainly please lovers of IDM. Best songs: “The Surface Of Last Scattering – Black Rain Remix”, “Galactic Motion – Black rain Remix”.